The Norway rat indirectly killed millions of people during the Middle Ages in Europe. The primary result of transmission of the Bubonic Plague was from infected rats fostering fleas. These 'carrier' fleas spread the disease to humans, in turn causing death. It is hypothesized that Norway rats were introduced into the United States in the early 1700s via trading ships and have since spread across the country with the largest, most concentrated rat populations occurring within inner cities. These are large, usually grayish rodents that are approximately 16 inches long including tail and weighing between 12 and 16 ounces. Three-week 'pregnancy' period; averages 8 to 9 offspring per litter. They consume an ounce of food per day and are highly dependent on water sources. Neophobic: meaning they are wary of new objects and foods in their environment. 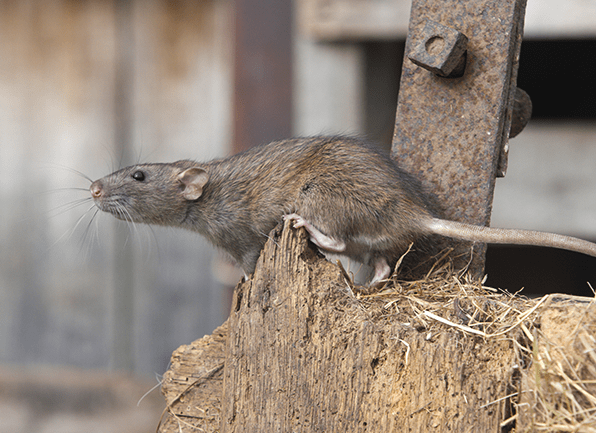 Norway rats can squeeze through 1/2-inch cracks and gaps. Most Norway rats live for less than one year. Keep shrubs, vines and tree limbs trimmed away from a structure. All gaps should be less than 1/2 inch in diameter to prevent entry. Do not use expanding foam to seal openings as rats can chew through this. Do not stack lumber, firewood, bricks, pipes or other debris next to a foundation. Vents (attic, crawl space, and dryer) need to be covered with mesh screens (< 1/2-inch). Organize storage areas so that they are 'clutter-free' with access to perimeter walls.